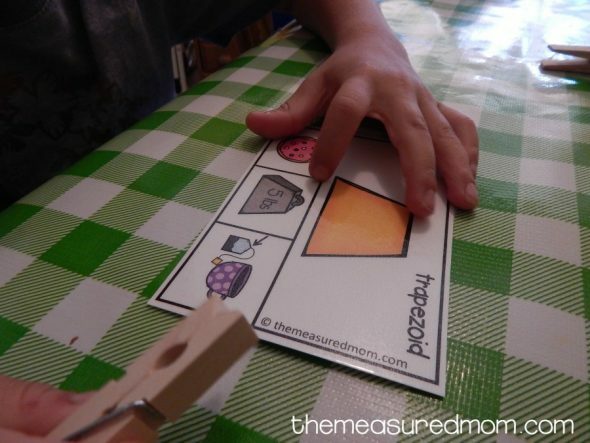 Today I’m sharing a fun freebie that will help your child see shapes in everyday objects. My four-year-old was in a sour mood this morning. I suspect it’s because it was the first day of school for his older siblings, and he had to adjust to three fewer playmates and a quieter house. Normally he asks for “projects,” but when I told him I had some activities for him this morning he was adamantly against it. I had a feeling that he’d change his tune, however, so I insisted. 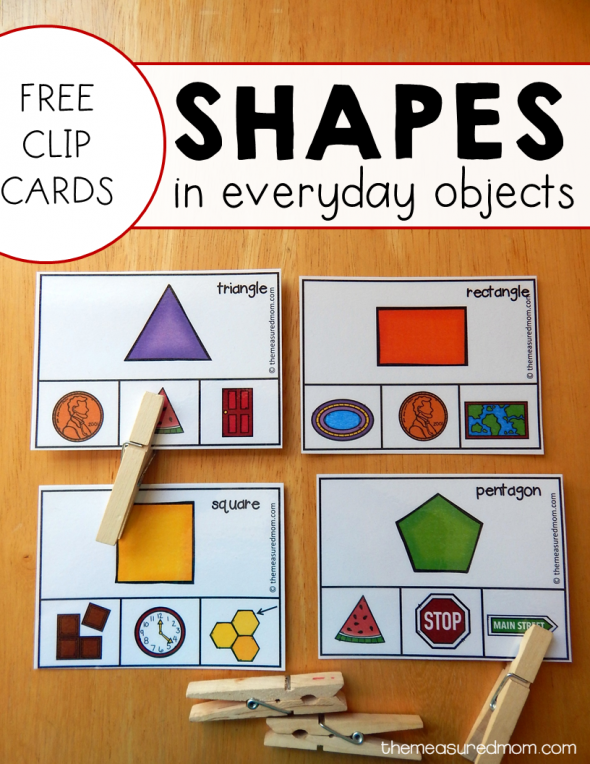 He can identify basic shapes quite well, so I created these clip cards to help him find shapes in everyday objects. Before I pulled out the first card, I called his attention to shapes in our kitchen. “What shape is our microwave? What about the clock above the sink? 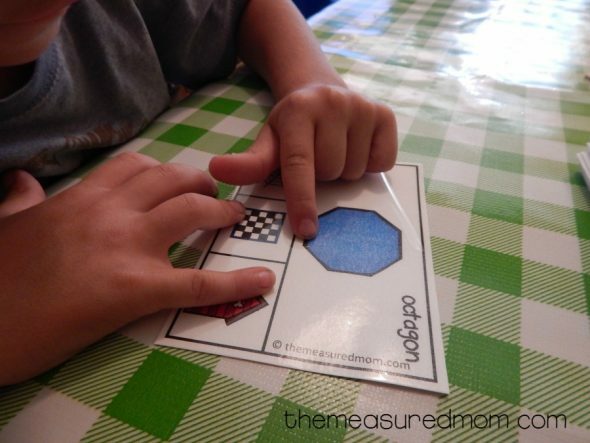 What shape are these tiles on the floor?” He easily identified the shapes as a rectangle, triangle, and square. Next, we shuffled the clip cards. He identified the shape at the top of each card before finding an everyday object beneath it which contained the same shape. The tougher shapes definitely challenged him, but he did a great job counting their sides and finding an object with the same shape. 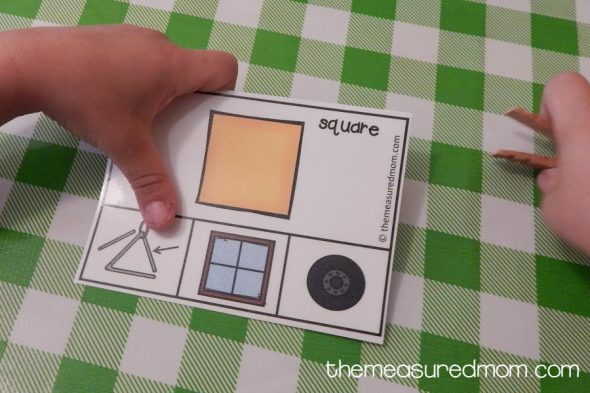 He spotted the trapezoid right away with this one! Before long, he’d gone through a bigstack of cards. We hope your learners enjoy it too! Wait! If you prefer to have the diamond called by its more accurate name, rhombus, download below. 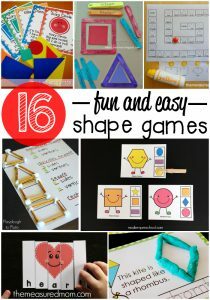 Check out more shape activities! Thank you for sharing such a great shape activity! 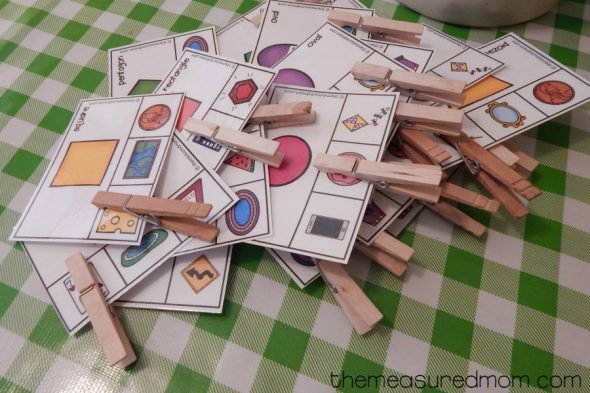 I know my kinders will enjoy playing with these cards. I am unable to download you’re shape clip cards? Any ideas why. Yes – all my ideas are in the link underneath the link to download the file. It says “Is the file not downloading?” You should find a solution there. 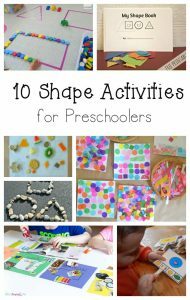 Thanks for sharing a great idea for centers and a fun, engaging way for cchildren to learn shapes. You’re welcome, Tammy – I hope you get a chance to use them! 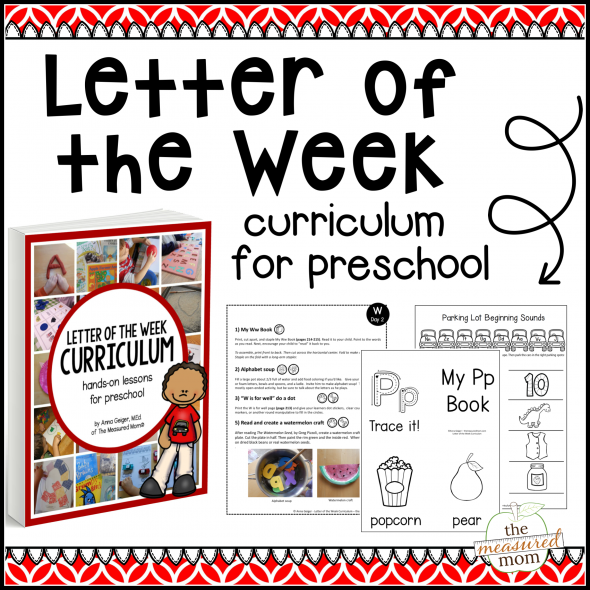 Will use these with my kindergarten ELL students. Suggestion for future: use academic math vocabulary for rhombus (instead of diamond). Thank you! I’m not sure if you noticed, but there are two downloads available: one using the word diamond, and one using the word rhombus. Hi, this looks fun! May i ask at what age did your child started this?